Dianne sold Int CH Merganser's Live Strong SH, WC to Caleb and Toby Anderson, owners of Top Dog Retrievers, Red Bluff, California in September 2011. Lance is now the best friend of their son, Cole. Lance recently became a certified therapy dog for the library reading program with children. Lance is a son of Master Hunter/Master National Finalist, Merganser's Hacker MH, WC, CGC. Lance's temperament, mannerisms, and looks are almost identical to Hacker's. 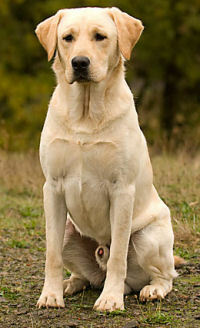 Lance exhibits the classic broad Labrador head, dark pigment, good bone, and nice length of leg. Lance is an exceptional marker, intelligent, very trainable, and a well socialized laid back housedog. Like his sire, Lance's main passion is pheasant hunting. Lance is a Senior Hunter. Lance achieved an International Championship show title in October 2007. Lance received a Working Certificate and an AKC Conformation Certificate at the Labrador Retriever Club National Specialty in October 2007. Lance's pedigree is the best of field and show. Warden Abbigail's pedigree (Lance's dam) goes back to the old Labrador lines of CH Receiver Of Cranspire, CH Valleywood's One Man Band, CH Tabatha's Remarque O Citadel JH, CH Brooklands Hampshire Bucky, CH Sandylands Rip Van Winkle, CH Lochiel Kresland Geordie Boy CD, and CH Sailin' Cajun's Casanova CD. Daniel Beck (Abbigail's owner) uses her to assist with drug detection and finding illegal poachers. Daniel is employed by the California Department of Fish and Wildlife. We also own Lance's sister, Int CH Merganser's Ruby JH, WC and sold Lance's brother, Int CH Merganser's Yellow Jersey JH, WC to Paradise Kennels, Felton, DE, 302-284-3008. Lance weighs 80# and stands 25 inches at the point of the shoulder.